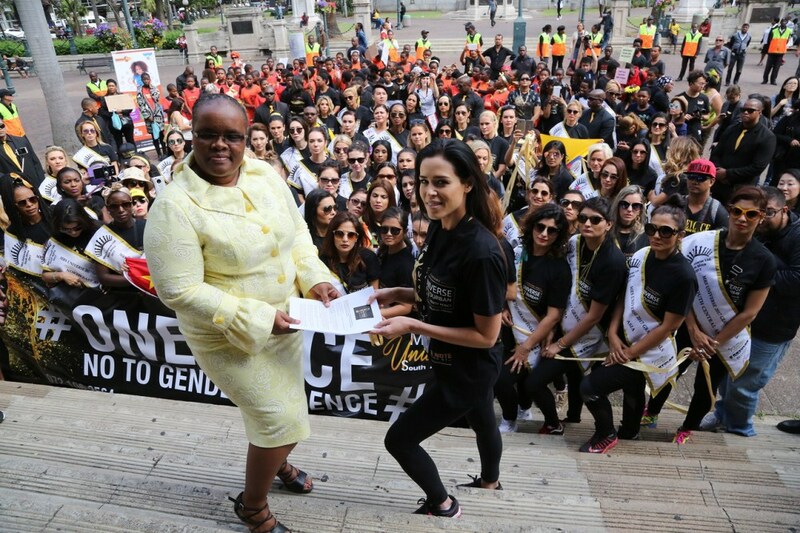 Tracey-Anne Aggett, Mrs Universe 2017 Hosting Director: Africa, led the demonstrators from King Dinizulu Park to the Durban City Hall. “As global citizens, as mothers, daughters, sisters, children, parents and caregivers, we have had enough of gender-based violence and child abuse,” Aggett said. 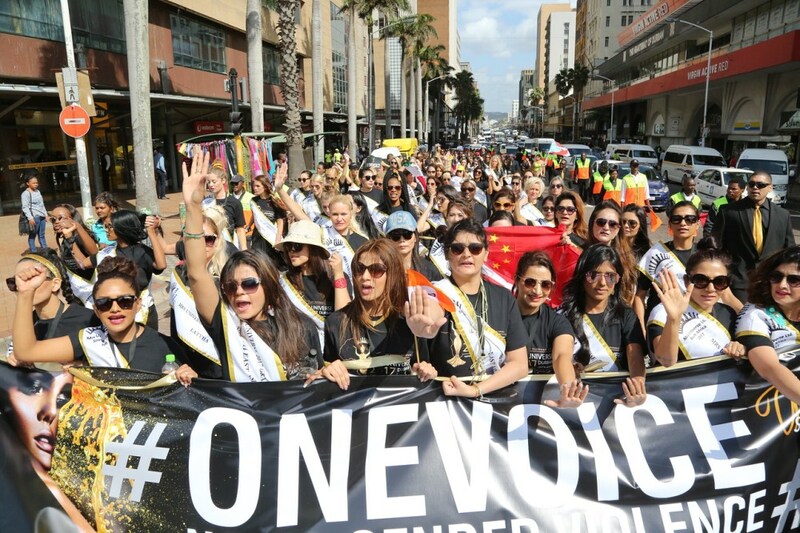 More than 80 Mrs Universe contestants, schools, civic organisations and concerned citizens took to the streets of Durban this morning for the global #OneVoice march against gender-based violence, child abuse and human trafficking. The demonstrators marched peacefully from King Dinizulu Park to the Durban City Hall where a memorandum was handed over to Councillor Nompumelelo Sithole who represented eThekwini Mayor, Zandile Gumede. 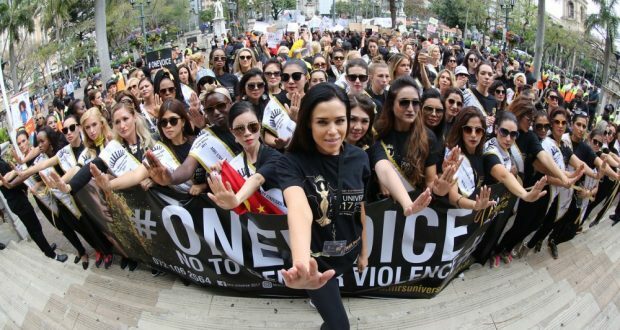 Dressed in black-and-gold, the #OneVoice marchers showed solidarity with the millions of women and children across the world who have been brutalized by and who continue to suffer at the hands of their abusers. “As global citizens, as mothers, daughters, sisters, children, parents and caregivers, we have had enough,” says Tracey-Anne Aggett, Mrs Universe 2017 Hosting Director: Africa. Receiving a memorandum from the group on behalf of Mayor Zandile Gumede, Councillor Nompumelelo Sithole, echoed the sentiments, rousing the group with calls of, “Down with violence against women! 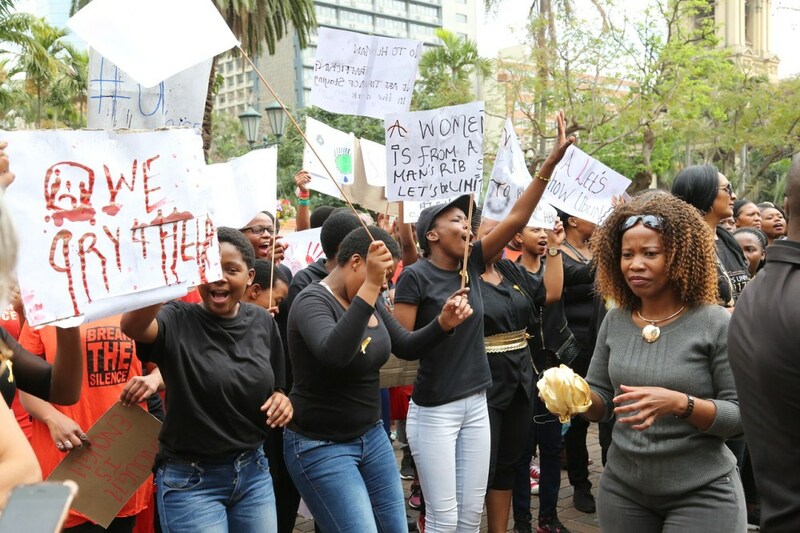 Up with the protection of women!” Sithole promised to hand over the memorandum to the Mayor and praised organisers of the #OneVoice march for unifying more than 80 countries for women empowerment initiative. 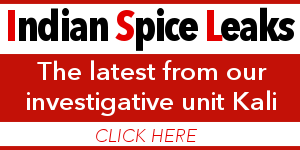 “As citizens of the world, we are extremely concerned about the growing global pandemic of violence against women and children. 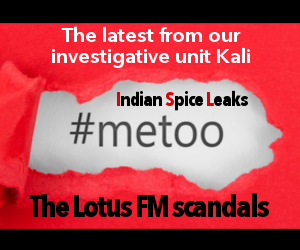 Irrespective of culture, class, education, income, religion, ethnicity and age, our women and children in every corner of the world continue to be brutalised with far-reaching physical, psychological, sexual and economic consequences,” the memorandum reads. 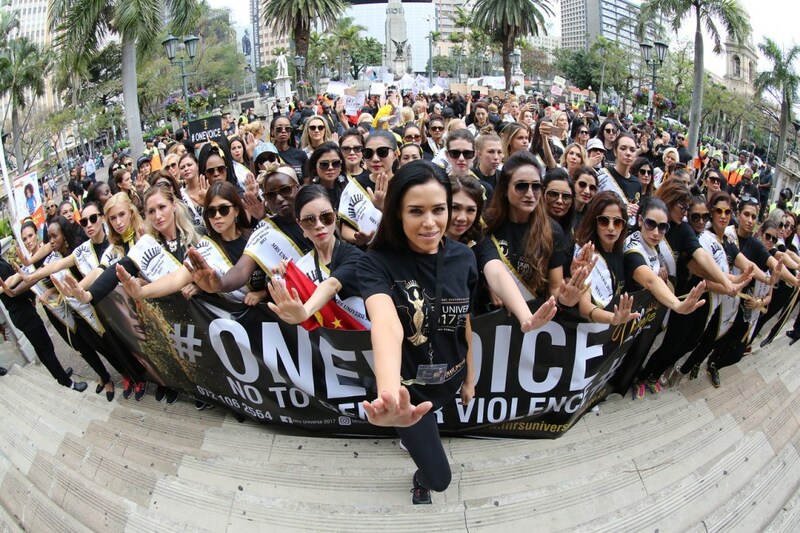 In a show of global support for the #OneVoice, simultaneous peaceful protests were held across the globe to highlight the concerns over child abuse and gender-based violence. 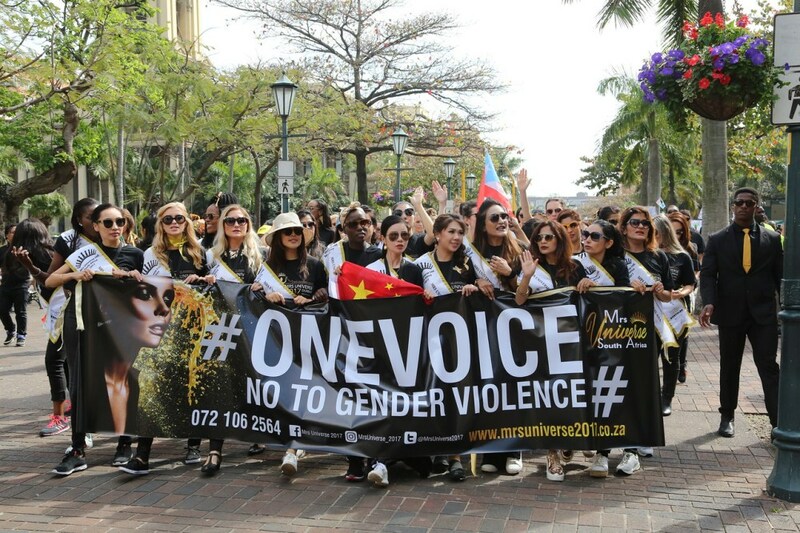 Mrs Universe contests from Nigeria, India, U.S.A, Ukraine, North Asia and Gibraltar have organised #OneVoice marches in their home countries to coincide with the SA event. 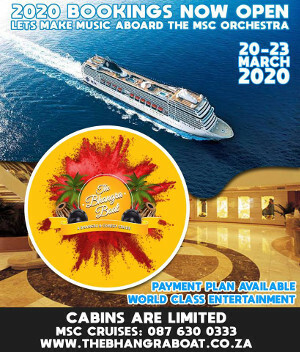 Here in SA, interest groups and individuals from around the country who could not travel to Durban hosted their own #OneVoice events albeit on a smaller scale. 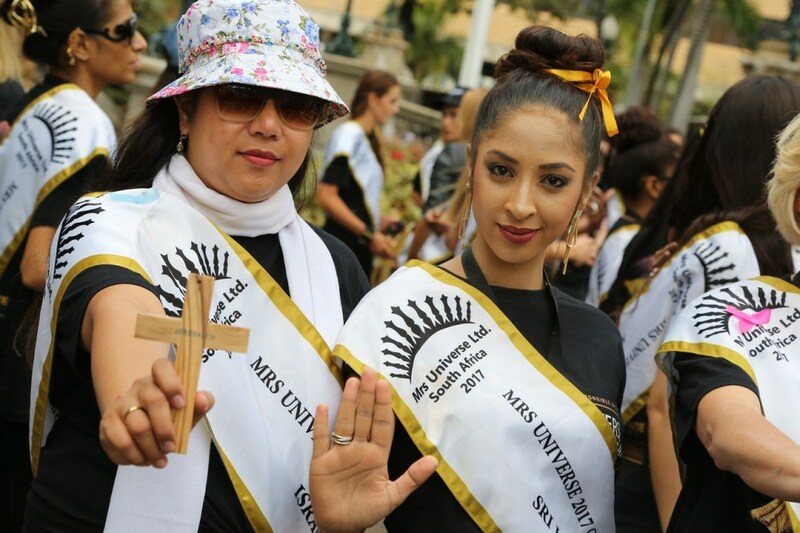 The #OneVoice march is part of a week-long programme of activities involving the Mrs Universe finalists that taps into the event’s theme, Empowering Women. Creating Change. 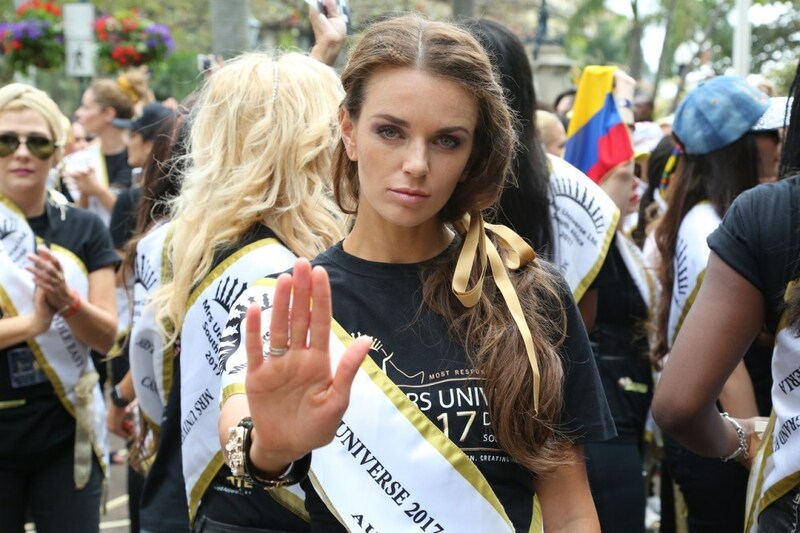 Durban has clinched the first-for-Africa rights to host the activist-themed event and Mrs Universe finals on 2 September 2017. 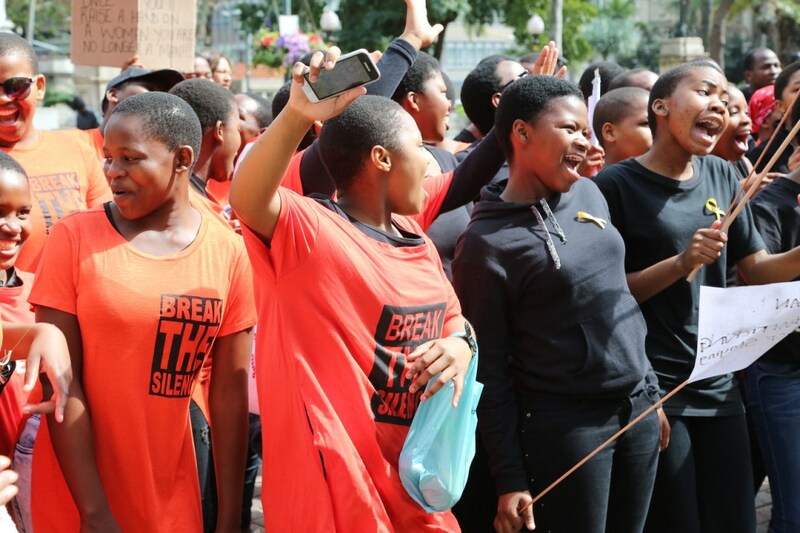 Pupils from three schools in Umlazi – Swelihle High School, Menzi High School and Vukuzakhe High School – as well as Pinetown’s Bhekisisa High School joined the #OneVoice march in Durban today. Mrs Israel (Reyna Zenaida Mary Alonzo Shannon-Delizo) and Mrs Sri Lanka (Thrikala Dharani Kalubowila) at the #OneVoice march in Durban today. Tickets for the Mrs Universe 2017 World Final at the Inkosi Albert Luthuli International Convention Centre on 2 September 2017 are available at Computicket from R150. For more information, visit www.mrsuniverse2017.co.za , email logistics@mrsuniverse2017.co.za or call 072 106 2564.